● Picking up travelers from hotel on departure time, and then driving to the Tiananmen Square and Forbidden City, the largest ancient imperial palaces group in the world with 500 years history.Visit the Forbidden City along the central axis from south to north for about 2.5 hours. 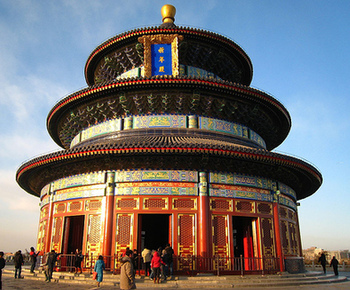 ● Drive (20 minutes) to the Temple of Heaven â€” the largest ancient imperial worship architecture group in the world. Visit it for about 1.5 hour. 6. the circular mound altar, etc. ● Have Chinese lunch (40minutes) in Taiyichun Restaurant. ●Driving (30minutes) to Summer Palace, the largest and most beautiful Chinese imperial garden. Visit it for about 2 hours. 6. the marble boat, etc. 5, At last, driving the travelers back to guest hotel. - Vehichle mode: Coaster-New air-conditioned tour coach (click for picture)- 26 seats, 6-10 persons per group. For Budget Coach Tour, besides pearl shop, TongRenTang shop is added in the tour. - Private tour is suitable for those individual or family travelers who is not willing to join the tour group, it may not feel very free when following the group. A designated car and private guide will follow you to go to the place you like, this package cost higher than coach tour. For the private tour, you also need go to one or two shopping stop every day. Children taller than 1.1 meter should be charged as full price, childern shorter than 1.1 meter should be charged only half of the price.